Jim Dooge, friend and colleague of so many scientists, was a giant of a man. His truly outstanding scientific achievements were accomplished with a sense of the highest integrity and yet with compassion and sensitivity for the feelings of those with whom he worked. Jim's interest in hydrology was stimulated by his background in engineering, which he then took to the highest scientific level. His careful and thorough study of hydrological systems resulted in seminal contributions to their mathematical modelling. With time, his interest expanded to cover meteorology and climate; he had considerable influence in shaping the climate change debate. 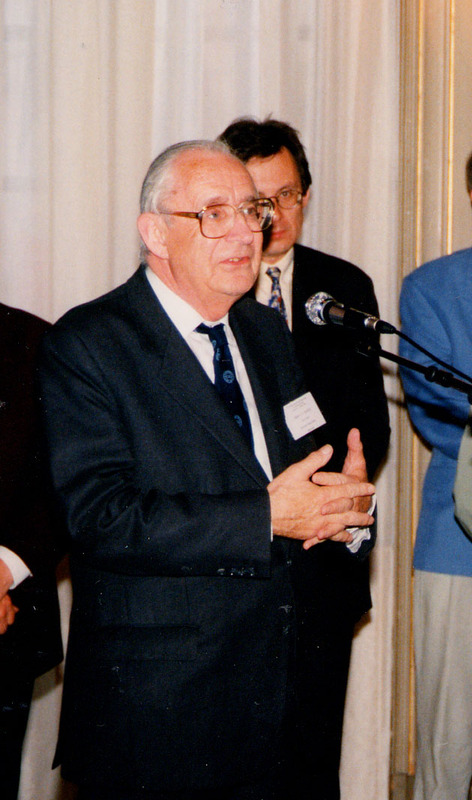 Jim served as President of the International Association of Hydrological Sciences (IAHS) from 1975-79; subsequently he became Secretary General of the International Council for Science (ICSU), 1980-82 and President of ICSU from 1993-96. 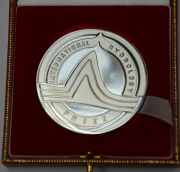 He was awarded the International Hydrology Prize in 1983 and the International Meteorological Organization Prize in 1999 (the only non-meteorologist to be so honoured). It was Jim who invited the International Conference on Water and the Environment to be held in Dublin in 1992 as a precursor to the Rio Earth Summit; the "Dublin Principles" have been influential in shaping water management policy in the last 20 years. Most individuals would have been satisfied with such a distinguished academic career. However, Jim had an equally brilliant political career, serving for many years in the Irish Senate as well as serving as Foreign Minister for Ireland. Further details of Jim Dooge the academic and the politician are provided in the two articles, below. Jim will be remembered with the deepest of respect and admiration. Although ultimately he was to play a prominent role in three separate arenas, Professor Dooge remains first and foremost an engineer who attributes much of his success in academe and public life to his solid grounding in the profession. Professor Dooge graduated in Science (Mathematics, Mathematical Physics, Geology) and in Civil Engineering from University College, Dublin in 1942 and in the same year was awarded the Pierce Malone Scholarship in Theory of Structures and Strength of Materials, open to graduates of all three colleges of the National University of Ireland. As he recalls, work opportunities were scarce at the time: "I was fortunate to obtain employment as Clerk of Works on the construction of a sewage treatment plant at Peamount Sanitorium." In 1943 he moved on to become assistant engineer on the survey and design of major river improvement schemes in the arterial drainage section of the Irish Office of Public Works. While there he was involved in a Survey of Brosna Catchment and of Glyde and Dee Catchments. He also carried out hydrometric surveys and calculations. It was at this time that a lifelong interest in hydrology had its beginnings. His renowned work in this field was to open up a network of international connections and distinguished service in a number of United Nations organisations. But that was to come later. He joined ESB in 1946 and became a design engineer with the Civil Works Department. He carried out studies of project planning and design for hydroelectric development, as well as hydrologic investigations and all aspects of the hydraulic design of hydroelectric schemes. He also worked on the hydraulic aspects of cooling water systems for steam power plants and conducted hydraulic model experiments for hydroelectric schemes and steam stations. "Working for the ESB was exciting and challenging. The organisation had a high level of civil engineering expertise and actively encouraged my interest in hydrology which gave me the opportunity to push the boundaries in the development of my knowledge of the subject." In 1954 he took a leave of absence for two years as Research Associate and Instructor in the Department of Civil Engineering at the University of Iowa, USA. This period in Iowa added an international dimension to his career which was to grow progressively in subsequent decades alongside his immersion in engineering and public service at home. In 1956, he returned to Ireland to work for the ESB and was responsible for the planning and design of a multi- purpose project for the improvement (flood control, drainage power and navigation) of the River Shannon, as well as other special projects. A new chapter opened for Professor Dooge in 1958 when he was appointed Professor of Civil Engineering at University College Cork. This was to be the beginning of the influential academic phase of his career and he was to remain at University College Cork for the next 12 years. In tandem with this, the international scope of his work also grew. Since the mid-sixties until recent years, he worked as an expert consultant to a wide range of specialised United Nations agencies including UNESCO, WMO, UNEP, and the FAO. He also acted in an expert consultancy role to DGXII (research) of the Commission of the European Union. In the sixties, he was active in developing an international network of hydrology scientists and engineers that stretched from the United States to countries behind the "Iron Curtain". "These contacts were very beneficial, enabling research taking place from all over the world to link up in meaningful ways and, in a sense, helping establish an international hydrological community. Initially, we were an informal group of six. This grew to the point where we had a committee of 12 and eventually led to the establishment of the [International Commission on Water Resources Systems within the (Inserted by G. Young) International Association for Hydrological Sciences at the XV International Union of Geodesy and Geophysics in Moscow in 1971." Typically, Professor Dooge was involved in some of the earliest work done to identify the causes of climate change. He was heavily involved in the discussions within the World Meteorological Association in 1978 that eventually led to the first World Climate Conference in Geneva in 1979. He witnessed first-hand the phenomenal growth in climate change awareness: "At that first conference the attendance was almost exclusively made up of scientists and engineers whereas when the second World Climate Conference took place in 1990, the scientists and engineers were joined by strong contingent of politicians, a sign that interest in the issues had broadened considerably." Professor Dooge was the first recipient of the Lifetime Achievement in Engineering Award from Engineers Ireland in 2006 and also was the first recipient of the Gold Medal in Engineering Science from the Royal Irish Academy in the same year. An article can only hint at the range of Professor Dooge's accomplishments. Fortunately, he is currently putting the finishing touches to his memoirs which will detail a lifetime of achievement and perhaps even provide a few political revelations that he was too discreet to disclose to the Journal! Former Minister for foreign affairs James Dooge, who has died aged 88, was a leading member of the Seanad for almost 30 years and played an important role in the development of the European Union. He was the last senator to be appointed to the cabinet and just one of a handful of members from the Upper House to have that distinction in the history of the State. Prof Dooge also had a distinguished career as an academic and had a worldwide reputation for his work on hydrology (the study of water and water resources). James Dooge was born in Birkenhead, England, in 1922 and went to school first in Liverpool and later at Dún Laoghaire CBS. He went on to UCD where he qualified as an engineer. He worked for the ESB and the Office of Public Works before doing postgraduate studies at the University of Iowa in the US. He was a research associate at the Department of Civil Engineering there before returning to Ireland in 1958 as Professor of Civil Engineering at University College Cork. He moved to the same position in UCD in 1970. Prof Dooge became involved in politics at an early age and was elected to Dublin County council for Fine Gael in 1948 and was twice elected chairman of the council, in 1950 and 1953. He was first elected to the Seanad in 1961 and continued to serve in the Upper House until 1987. He was Cathaoirleach from 1973 to 1977 during the Fine Gael-Labour coalition led by Liam Cosgrave. Prof Dooge was a friend and close political associate of Garret FitzGerald from the 1960s onwards and was heavily involved with the Just Society wing of Fine Gael. When Dr FitzGerald became leader of Fine Gael in 1977, Prof Dooge was one of his closest policy advisers. He was one of the Fine Gael team who negotiated the coalition deal with the Labour Party in June 1981 and was appointed minister for foreign affairs by FitzGerald. Prof Dooge was widely regarded as an inspired choice for the post but his appointment was relatively short-lived because the government lasted only 18 months. He was not reappointed to the cabinet in Dr FitzGerald's second coalition although he was re-elected to the Seanad. However, he was given a significant role in the development of the European Union during the Irish presidency of 1984. He chaired what became known as the Dooge committee which drew up a report to the European Council on the framework for institutional reforms. This was a crucial step on the road towards agreement on the Single European Act which led to agreement among the members of the European Economic Community to form the European Union. Prof Dooge returned to academic life after retiring from politics and was elected president of the Royal Irish Academy. Chancellor of the National University of Ireland Maurice Manning in a tribute to Prof Dooge last night described him as "a towering figure in Irish academic life for over half a century." Dr Manning said that Prof Dooge's "contribution to public life was one of integrity and great intelligence as a minister, senator and adviser to a number of Fine Gael leaders".